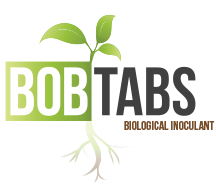 BOB Tablets are an All Natural Soil Probiotic specifically formulated for horticulture. BOB Tablets contain the beneficial bacteria and beneficial fungi found in healthy soils. BoB Tablets Effect on Plant and Soil Stressors. BoB Tablets have proven to aid in the reduction of plant and soil stressors that restrain growth. Stressors kill off bacteria and nutrients that plants need to grow. Bacteria have a primary function in biological terms to induce growth through the process of breaking down organic matter and nutrients so that the plant roots can absorb them. Stressors destroy and kill off both bacteria and nutrients, denying those elements the crucial role of improving nutrient absorption and promoting growth. The other major limiting factor in crop yields is crop loss due to pests or disease. BoB Tablets greatly reduce plant vulnerability to pests and disease by providing significant boost in the plant’s natural immune defense. NEED MORE INFO ABOUT BOB-TABS? Feel free to download our Bob-Tabs brochure!